Most SaaS companies with freemium business models or free trials have poor post-signup user engagement. Poor user engagement leads to churn, and churn makes it pretty darn hard to grow. If you’re experiencing low free to paid conversions, or a high churn rate, we’ve put together a an actionable plan to help you both diagnose your user engagement problem and solve it. If your users are churning, you’re going to need to talk to them about it. Users often have valuable insights but are not given the opportunity to share then with you. To open up the floodgates of information and feedback, you’ll have to make yourself visible to them. Get users to talk to you about what isn’t working by using a variety of in-app chat widgets, phones calls, client visits, feedback forms etc. The key here is to take every conversation that you can. And to consider the root problem of each piece of feedback. 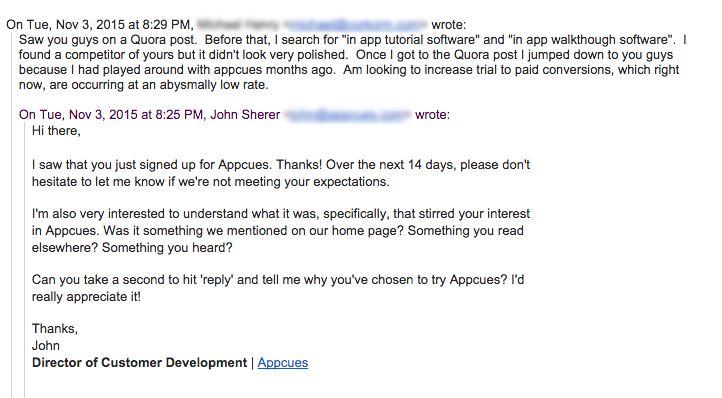 One of our favorite tactics at Appcues to get feedback is with an automated message via Olark. This prompts a user to give feedback at a critical moment in their product usage. It may help you garner feedback by adding an illusion of human touch on top of your tactics. Have emails come from individuals rather than noreply addresses or teams and add pictures of your team where appropriate to show your users you’re there and ready to field inquiries. As a product owner, we often get jaded when thinking about how to use our app. We know the flows better than anyone, and we lose track of where our hangups might be. Watching user sessions is like a shot of empathy to the brain. You notice all of the little things a new struggles with and it’s eye opening. Inspectlet has a session recording tool that lets you watch your users’ sessions in your app. Keep an eye out for where your users are getting lost or confused. Did you know you can record user sessions—mouse clicks and keystrokes—with certain customer development tools? User session recordings can also help you diagnose bugs when a user writes in. It’s a double win. You don’t always get things right the first time. In fact, in software, you hardly ever do. There’s always tweaking or overhauls that can be made to improve your product. User tests are an important part of the software development process because they allow you to get feedback from unbiased users. This feedback is critical to helping you figure out how to improve your product experience for the future. User tests help you identify points of friction in your application—or even your marketing site—that you otherwise might have missed. When you take the time to observe and record these points of friction, you end up with a laundry list of UX enhancements to make that will help the user find success faster. If you haven’t run a user test before, it’s actually pretty simple to set up and execute when you put the right steps together. Here is the process on how to run your first user test like a pro from the UX sisters. 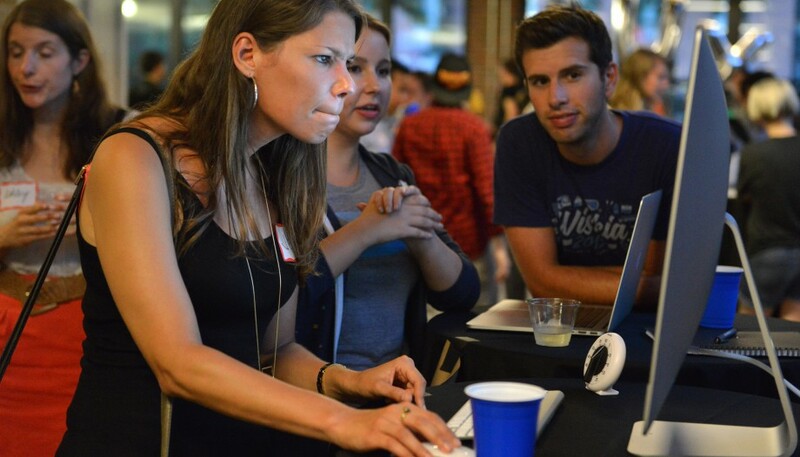 If you’re looking for a fun idea to get some users testing in a casual manner, try hosting a user testing party. We did. And we gained a ton of value while having a lot of fun. Have you considered that perhaps it’s only a certain persona group that might be having trouble engaging with your app? You might want to try segmenting your users by persona and measuring their success metrics relative to one another. It could be that you’ll find a certain group of users is much more successful in your product than others. Or perhaps they are more interested in a certain module of your product. This in turn could influence your marketing and user onboarding process. 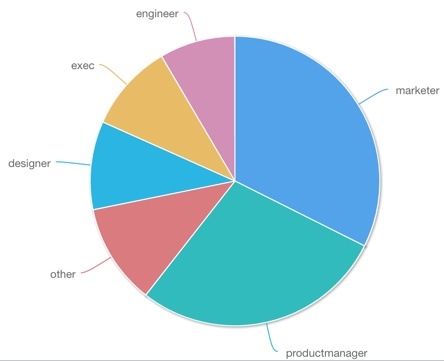 Mixpanel or a similar tool is a great place to start looking for this data. You’ll likely want to compare your leads to customers by different personas. A screenshot of Appcues’ October 2015 demographic sign-up data. One way to get qualitative insight is by conducting onboarding and offboarding surveys. *An onboarding survey is conducted when a user first signs up for your app, and an offboarding is after they churn. By gathering insight about a user’s intentions when signing up for you app, you can get a better idea of what they are looking to accomplish with your app. This will help you make sure your marketing site’s promise is aligned with your product’s ability to fulfill these goals. Further, an offboarding survey from churned customers may help you identify where you fell short helping that user meet their goals. Here’s a great post on conducting an effective offboarding survey. Surveys can be implemented easily through event-based email services such as Customer.io or through in-app survey tools like Qualaroo. Once you’ve identified some of your app’s current misses, you’ll be better able to fix them and improve your user engagement.